This morning, U.S. Ambassador to Haiti Kenneth Merten speaks with TODAY’s Meredith Vieira about logistical challenges behind search and rescue operations in Haiti. He also said the embassy is doing its best but has no way to check on the 40,000 or more Americans estimated to be in the country. This NBC report says that about 450 Americans have been evacuated since Tuesday’s disaster. Ambassador Kenneth Merten said “a steady stream” of U.S. citizens has been showing up at the airport and embassy seeking help leaving the country, but so far not in overwhelming numbers. I think the main challenge in calamities like this is how do you track or trace a large number of people overseas in an emergency. Even if you have the local addresses, what do you do when phones are not working, when there are no doors to knock on, or when entire neighborhoods are simply gone? This city has an estimated population of between 2.5 and 3 million people. The UN’s initial estimate is that 10 percent of the housing in the Haitian capital Port-au-Prince has been destroyed, leaving some 300,000 people homeless. The World Food Program is aiming to feed two million people for about 30 days. That’s pretty mind-boggling. The report also says that U.S. soldiers were sorting the Americans for evacuation at the airport. It quotes that people without citizenship were angry and cites one Vladimir Lexus, a 23-year-old musician who lives in Miami who said: “I can’t believe this!” I don’t know what the airport set up is like but if 450 Americans have already been evacuated, I’m sure there are Consular Officials at the airport to check on the citizenship of evacuees and prepare evacuation documentation as they are required to do. Update 1/17/2010: This one from NDS: Haiti: Some Numbers | Number of consular staff working the massive crowds at Haiti’s airport, before reinforcements from Consular Affairs arrived: 4. That’s right. 4. If you are overseas now, take a moment to register here with the State Department (https://travelregistration.state.gov/ibrs/ui/). By registering your trip or your presence overseas, you help the embassy or consulate locate you when you might need them the most. Registration is voluntary and costs nothing, but it should be a big part of a traveler or overseas resident’s planning and security. Second – if you have children born overseas, it is helpful to document their citizenship as soon as you are able. You don’t want to document their citizenship amidst an evacuation. 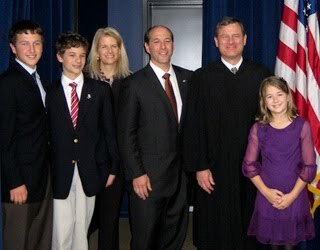 Ambassador Jeffrey Bleich was formally sworn in by U.S. Chief Justice John Roberts in a ceremony on December 20 at the White House. The event was attended by the Ambassador’s family, government officials and Elizabeth Ward, the Chargé d’Affaires of the Australian Embassy in Washington. Ambassador Bleich and Justice Roberts worked together as clerks for the former Chief Justice William Rehnquist. Note that he had his SFRC hearing on November 5, and five days later, the Senate discharged from further consideration and confirmed his nomination by unanimous consent. I haven’t been able to keep up with all of my emails since leaving the White House. As some of you know I was confirmed by the Senate on a Tuesday night at 10:15 p.m., and raced out to post soon after, and I’ve had a flood of emails and questions from many of you here. So since so many friends are here, I’d like to respond to some of those emails now. First. Yes – to those who asked – there were actually senators on the floor at 10:15 at night on a Tuesday night. Actually I prefer Jim Messiness’ explanation for the unanimous vote that every senator, regardless of their political views, shared a desire to send me 10,000 miles away from them. Second, thank you all for the suggestion about learning how to speak Australian. We are, after all, two great countries separated only by a common language. Becky and the kids and I have begun extensive training and, no worries, mates, we’re picking up ’strine. Third, because we are all friends here, yes I did tighten up the security on my facebook account recently if you’ve been trying to reach me. I promise that if you stop sending me emails referencing Fosters Lager and your favorite Crocodile Dundee line, I’ll re-friend you. Finally, yes, there are guest rooms, and no you can’t actually move in until we get there first. Read Ambassador Bleich’s full remarks. The Foreign Service National (FSN) Emergency Relief Fund enables the Department of State to respond to crises affecting locally employed staff overseas, such as the recent earthquake in Haiti. To donate to the fund, send a check to the Department’s Gift Fund Coordinator, Donna Bordley, RM/CFO, Rm. 7427, 2201 C Street NW, Washington DC 20520. Make checks payable to the U.S. Department of State, designation for the “FSN Emergency Relief Fund.” (h/t to AAFSW). State and USAID employees may also check their intranet for guidance on donation by cash or credit cards. The Fund dates from April 1983 when FSN employees at the U.S. Embassy in Santiago collected funds to support the families of colleagues killed or injured in the bombing of the U.S. Embassy in Beirut—and by DACOR’s unsolicited donation to the U.S. Ambassador in Lebanon to aid bomb victims. Besides Beirut, Nairobi and Dar es Salaam, the fund has assisted FSNs in Tegucigalpa, Dhaka, Santo Domingo, Niamey, Athens, Karachi, Algiers, San Salvador, Freetown, Maputo, Ndjamena, Caracas, Bamako, Islamabad and São Paulo. FSN employees in earthquake-wracked Algeria and war-torn Liberia have received assistance from the fund, along with local employees in Jamaica, Grenada, the Bahamas and Haiti— countries ravaged by hurricanes in 2007. Unlike other appropriated activities, the relief fund is based completely on donations from the foreign affairs family. The fund has no administrative costs, so 100 percent of every donation is disbursed to LE Staff at U.S. posts around the world. The fund receives requests to provide financial support to employees who have been devastated by natural disasters, political unrest and serious injuries or death occurring in the line of duty. The aftermath of a catastrophe can be especially devastating for LE Staff, once they realize the enormity of the disaster. In the past 26 years, approximately $651,000 has been disbursed among the regional bureaus. Since the 1983 Beirut embassy bombing, the fund has assisted many families of employees at posts attacked by terrorists. Jennifer McIntyre, a supervisory post management officer in the Bureau of Near Eastern Affairs, said the fund means a great deal to her colleagues. Requests for disaster assistance from the fund are most common. In May 2008, Cyclone Nargis destroyed the homes and property of 281 LE Staff at the U.S. Embassy in Rangoon. The government of Burma provided no public assistance, and most of the affected individuals had to buy imported high-cost building materials to rebuild. After reviewing each case, the fund disbursed $34,400 for property claims. In recent years, support for the fund has come from Foreign Service officers who named it as a beneficiary in their wills or from requests that donations be made to the fund in lieu of gifts at weddings or flowers at funerals. Foreign Service Nationals (also known as “LES”) provide unique services in support of foreign policy at nearly 265 posts worldwide. LE Staff are an integral part of every US mission overseas, providing continuity, the institutional knowledge and professional contacts that are so important to the embassy. US government agencies under Chief of Mission authority depend on their continuity staff, frequently delegating to them various supervisory roles and program functions. For those not in the know, local staff are also compensated based upon prevailing practice in-country and are usually paid in host country currency. The situation in Haiti — with such a large scale devastation of structures will probably be comparable to Cyclone Nargis in Burma where 281 LE staff of US Embassy Rangoon lost their homes. Please think about the embassy’s local staff in Haiti when you’re considering a donation. [W]e are saddened to report that Ms. Victoria DeLong, a cultural affairs officer at the U.S. Embassy Port-au-Prince, died in the collapse of her home following the earthquake in Haiti. Her next of kin have been notified. Ms. DeLong served in Haiti since February 2009 and at the State Department since November 1983. It’s a tragedy for the State Department and for our family in the public diplomacy and public affairs world. Some of you who are old-timers here – she was previously – did serve in our Bureau of Public Affairs during her career. No word yet on casualties among the embassy’s local employees. Updated: Secretary Clinton has released a statement on the passing of Victoria DeLong. Read it here.